Southern Vipers finished top of the inaugural Super League table, beating Loughborough Lightning by 59 runs to automatically qualify for the final. Both were already through to Finals Day on 21 August, but Vipers' bonus-point win means that Lightning now contest the semi-final with Western Storm. Spinner Linsey Smith's 3-16 helped bowl out Lightning, chasing 157, for 97. Meanwhile, Anya Shrubsole's five-wicket haul helped Storm beat Yorkshire Diamonds by six wickets at Headingley. Little-known 21-year-old spinner Smith again continued to look at home at Southampton, bowling against some of the best players in the women's game. Smith bowled internationals Dane van Niekerk and Sophie Devine in her first over before trapping the well-set Evelyn Jones lbw in her second to dismantle Lightning's top order. Former England all-rounder Arran Brindle continued to impress as her 3-24 finished Lightning off with seven balls remaining. England strike bowler Shrubsole's superb four-wicket final-over maiden blew the Diamonds away at Headingley, as the 24-year-old claimed the first five-wicket Super League haul. 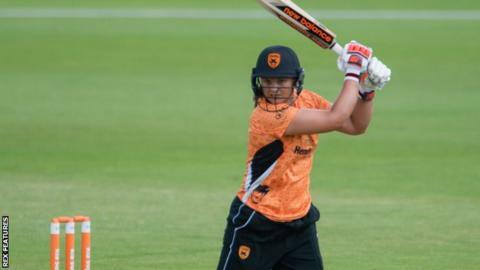 Having earlier bowled Holly Armitage for an eight-ball duck in the third over, Shrubsole then dismantled Jenny Gunn and Katie Levick's stumps, had Shabnim Ismail caught behind and Danielle Hazell caught, to bowl the hosts out for 118. Rachel Priest's half-century, which came off 35 balls and included six fours and two maximums, eased Storm home with 21 balls spare, to give Heather Knight's side momentum going into Finals Day.